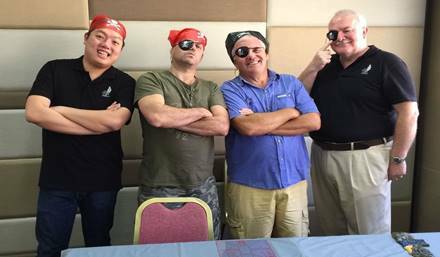 Typical 17th Century seafarers: ‘ard fighting, ‘ard wenching, ‘ard drinking rascals all: From L to R Admiral Sir Francis FitzLeigh, Corsair Jack “Birdy” Ward, Pirate Hector Barbossa and Diarist Samuel Pepys. 6 AM: Awakened early by the mewing of the cat on the bed. Elizabeth’s snoring made it impossible to get back to sleep so I rose, completed my ablutions, and breakfasted handsomely on refried pease pudding, cheese, and small beer. 8 AM: By chair to the office. The carriers took a divergent route and tried to charge me more than the customary three farthings. Thrashed them soundly. 9 AM: Despatches arrived from the Mediterranean which I opened in anticipation of news of a great victory against the pyrates of Barbary that would enhance the value of my recently acquired shares in the Company of Merchants of England trading to the Seas of the Levant. 9.10 AM: Took chair post haste to Jonathan’s Coffee House whence I sold said shares before others get wind of the events at Sidi Bir Tee. 10 AM: Returned to office to brief James, Duke of York, Lord High Admiral of England, after first advising him to dump his shares in the Levant Company which he did with alacrity. It will be recalled that that the evil pyrate, renegardoe, most foul and un-Godly apostate, and Barbary corsair Yusuf Reis, also known as that English mutineer Jack "Birdy" Ward, had gone too far this time in his depredations of British and Dutch shipping in the Mediterranean. Consequently an Anglo-Dutch naval expedition had been put together to scourge this Barbary nest of vipers once and for all. Ward had taken his prizes into the little port of Sidi Bir Tee on the coast of Tunis which is home to the Dey of Tunis’ summer villa. In addition to Ward's squadron of round ships, that included a huge converted Venetian argosy and several smaller vessels, a Tunisian galley squadron was based on the town. The Roads of Sidi Bir Tee provide a good, deep water, anchorage and are protected from the elements by the Islas Las Muertos that lie off shore, and from intruders by the Old Castle that lies above the town and by the much bigger, and more formidable New Castle that dominates the entry to the roads. The formidable New Castle at Sidi Bir Tee. Five prizes lay in the Roads, two British, two Dutch, and the handsomest prize of all a plump, fully laden East-Indiaman seized by Ward outside the Straits of Gibraltar. These were guarded by a few fustas. If Ward’s depredations were not bad enough word had come that the vile pyrate Hector Barbossa, master of the Black Pearl, had abandoned his usual cruising ground in the Caribbean and, seeking richer pickings in the Mediterranean, and was lying in Sidi Bir Tee and preparing to sally forth against Levantine shipping. A brace of flagships: Ward’s Reniera e Soderina with Barbossa’s Black Pearl nearest the camera. The English and the Dutch both assembled considerable squadrons under the command of Sir Francis Fitzleigh and Schout bij Nacht Yeffries Herbertzoom respectively. They planned to enter the roads on the on-shore breeze after dawn when the Turks would either be in the Mosque or recovering from the night's debauch according to their predilections. 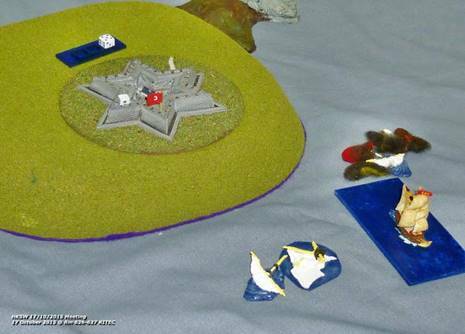 Whilst naval landing parties dealt with the New Castle, the main squadrons would destroy the defences; recapture their own prizes; sink, capture or burn the two corsair squadrons; and loot the untold riches of the Dey's villa. It seemed like a fine plan. The Approach at Dawn as seen from Sidi Bir Tee: The Old Castle, the Dey’s villa and the town are in the foreground. At the top of the picture the British and Dutch lines come on strong with the landing parties of both nations rowing inshore of them. Jack Ward’s squadron is moored under the guns of the New Castle with the galley squadron beached behind them. The prizes are anchored in an extended line between the Islas Los Muertos and the port. The Black Pearl lies off the port bow of the line of the prizes. Away from the watchful eyes of their admirals the landing parties made a tardy and disorganised approach, the Dutch and English marines rowing slowly towards the fatal shore. Only the Dutch yacht and sloop piloting them made landfall. A devastating fire from the star fort crippled the vessels and only one landing party assaulted the fort: to be easily beaten back with some loss. A brave little corsair galliot, the Full Moon, set upon and dispersed one flotilla of longboats before being quickly sunk herself by the guns of the main Dutch squadron. Whilst the New Castle was so engaged the Anglo-Dutch battle squadrons sailed majestically onwards, seeming to sweep all before them. Yeffries Herbertzoom had taken the position of honour for himself, leading the Dutch line which was the closest to the coast in his flagship Zeven Provincien. Well aimed shots damaged, but did not silence, the star fort which also replied with some, but not dramatic, effect. Herbertzoom then brought his guns to bear on Ward’s squadron which was only now getting under way and working slowly against the wind. Devastating full broadsides and poor powder storage quickly accounted for the Rubi, the Little John and the Carminati. Meanwhile the British squadron was also bearing in fast. Fitzleigh had chosen to lead from the centre of his line with his flag in the Royal Charles and the squadron was led by the Charles Galley, a frigate equipped with sweeps and thus very manoeuvrable, especially in light Mediterranean airs. Fitzleigh had also taken the precaution of despatching the Margaret Galley to secure the shoals of the Islas Los Muertos. Margaret Galley was a most singular British warship, a fully-fledged galley that was based at the British possession of Tangiers and whose enslaved rowers included a contingent of Native Americans captured by the fierce Uncas in the Colony of New York. Looking over the bulwarks of the Margaret Galley that morn, as they rowed like men possessed under the overseer’s lash, and they watched the main squadron thunder out its broadsides, they could have been forgiven if at least one of them did not note: “we are not in Kansas anymore Toto….” They would also have noted that the Black Pearl was herself getting underway, and standing against the entire British line poured a devastating bow rake into the Charles Galley setting her afire. Barbossa had to pay the price for this bold move as it exposed his stern to Zeven Provincien which quickly raked him in turn. The Onslaught: Shortly after this woodcut was engraved Dutch full broadsides will reduce Ward’s squadron from five to two ships. 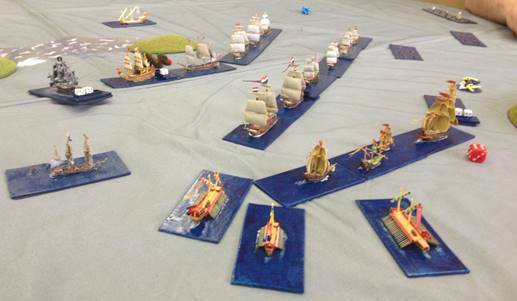 The galleys are coming into action but their limited firepower will hardly dent the Dutch line. Barbossa has raked and set afire the Charles galley but in turn exposed himself to a rake from Zeven Provincien. At the top the Margaret Galley secures the shoal waters beyond the Islas Los Muertos. By now Tunisian morale was rapidly plummeting. Not exactly being morning people at the best of times the Commander of the Galleys and Jack Ward were both always a little grumpy until the former had had several cups of thick Turkish coffee and the latter had found that the Sun was over the yardarm somewhere. Now their rapid losses, and the disparity in firepower between their ships and their assailants was filling them with despondency. The Commander boldly led his flagship, the Rose of Tunis at Zeven Provincien but even the guns of his most powerful galley barely scratched the Dutchman’s paintwork. Sensing victory Herbertzoom put his helm down to run his line alongside the line of prizes and liberate them all. And as tidy a piece of seamanship as you could like to see it would have been too, but then fate intervened on the Turkish side as Brederode, the third ship in the Dutch line, had her rudder shot off by a lucky shot and could not make the turn! The flagship Zeven Provincien and her consort Endracht set off alone as the Barbary galleys, what was left of Ward’s squadron and the batteries of the New Castle concentrated on the rear of the Dutch line. At this point Dutch command, which so far had been superb, collapsed. The Endracht misconstrued the Admiral’s intention and set off out of the Roads by herself and Zeven Provincien could not stop her headlong run with the wind broad reaching until she grappled a prize at the very far end of the line, smashing through a flotilla of Barbary fustas on the way. Meanwhile the crew of Charles Galley had put the fire out just as they fouled the Black Pearl and out of the smoke came Captain Barbossa leading his boarders. To avoid this dogfight the rest of the British line turned to port… taking them straight into the confused mass made up of the rear of the Dutch line and the beginning of the line of anchored prizes. The Turning Point: The Commander of the Galleys looks up for divine inspiration. His hand is obscuring the position of the Zeven Provincien which has just run down his fustas. To its starboard the Endracht is sailing off by itself. In the centre the British line has turned to port to avoid the grappled Charles Galley and Black Pearl but this has brought them into the congested area filled with the rear of the Dutch line and the anchored prizes. Now the Corsair galleys move in for the kill, shot in by Ward’s roundships and the star fort. The misfortune to the Dutch brought on by Brederode’s rudder failure was now compounded by an earlier tactical decision of theirs. The ships at the rear of their line were those that had given up their marines and crews to make up the landing parties. Consequently they were at a serious disadvantage when the fierce Turkish Janissaries came storming aboard them. At the front the Rose of Tunis and Brederode fought each other to a standstill, both crippling their crews with heavy losses, their scuppers awash with blood. At the rear the plucky galliot Autumn Moon took on the slightly larger Berlin and, with the help of some well-aimed broadsides from Reniera e Soderina, prevailed. In the centre the Liefde’s crew fought lamely and quickly succumbed to the Flying Horse. And as the smoke cleared in the struggle between Charles Galley and Black Pearl a tall figure raised a black, richly feathered, hat, called for three cheers for victory, and took a bite out of an apple… Barbossa had triumphed! 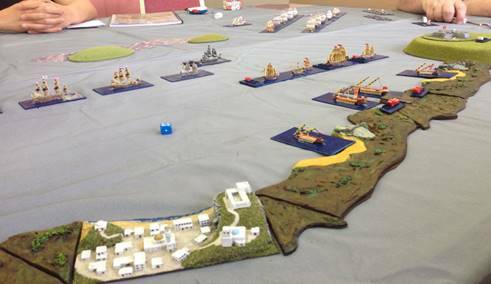 The Decision: At the top the Tunisian Galleys storm the Dutch line, taking two out of four and fighting the third to a mutually exhausted standstill. At the bottom the Black Pearl and Charles Galley continue their struggle. In the middle the British attempt to thread their way through the melee. With the Zeven Provincien and the Endracht well upwind of the struggle it would have taken too long for them to beat back and support the British who quickly seized the prize at their end of the line and broke off the action. But the morning held one last surprise. As Barbossa sent Charles Galley off with a prize crew he started manoeuvring the Black Pearl to avoid the shoals. It was then that the Margaret Galley came bows on and fired her only shots of the day, (and first shots ever.) The Pearl caught fire and this spread to her magazine…. Some say that even after the explosion a tall figure in a black, richly feathered, hat was seen calmly sitting on some flotsam and eating an apple… until a mistaken broadside from the Charles Galley destroyed the last wreckage. It is not known if the Dey of Tunis was in his summer villa that day, but if he was he would have smiled over his morning coffee. 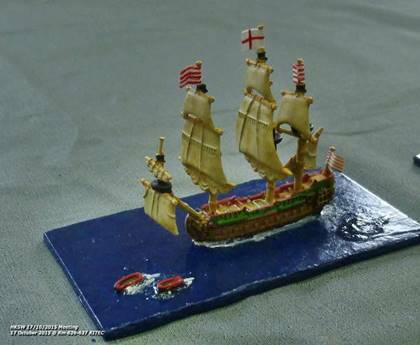 The Dutch had re-taken one ex-English prize, and the British re-taken one ex-Dutch prize, but the bulk of the prizes remained his, including the plump East Indiaman, and his shore installations had been barely scratched. His losses had been more than made up by the ships taken which would provide sound hulls to re-equip his roundships and many slaves to power his galleys. That Barbossa would no longer cruise these waters was not a bad thing either… one thing that a good pirate does not need is another good pirate preying upon his prey. It is bad for business. The Safe Haven: The Rose of Tunis on the right and the Flying Horse return to their berths as the Mediterranean shimmers in the sunlight of a great victory. 12 Noon: My briefing finished, My Lord the Duke of York thanked me for my services to the Crown and to his Privy Purse. With his shares in the Levant Company sold he could face the future with equanimity. He noted that the performance of the Margaret Galley had been a bright point in the action. Clearly His Majesty’s Navy needed more such vessels and I was to be in charge of the tender board for construction and fitting out. That should be worth a pretty penny. 1 PM: By chair to the Cheapside. The carriers took a divergent route and tried to charge me more than the customary three farthings. Thrashed them soundly. Lunched handsomely on oysters and sack. 3PM: To Mistress Betty Lane’s. She left me almost defessus of the pleasure. 9 PM: By chair to home. The carriers took a divergent route and tried to charge me more than the customary three farthings. Thrashed them soundly. Wrote up my diary, I fear the poor light is increasingly burdening my failing eyesight. 11 PM: And so to bed…. 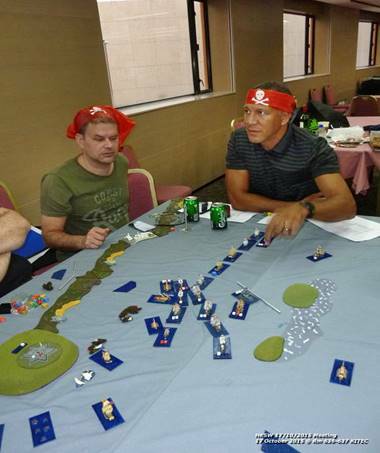 The game was played out using Nick Wright’s excellent “Galleys and Galleons” rules with a few amendments to align them with DBR ships and to allow for squadron moves amongst other things. The amendments are here. 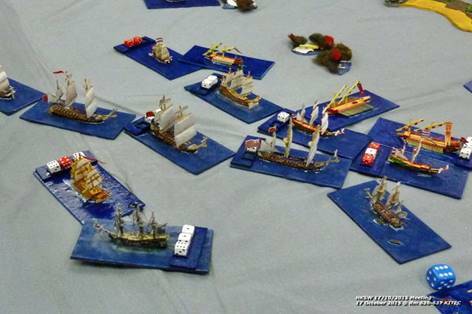 Some 31 ships fought it out over a 6’ x 5’table The Tunisians had 418 points and the allies 633 points not counting the prizes, the landing longboats, or the Black Pearl which could have fought on either side although on this occasion Barbossa chose to obey the Pirate Code and he struck with the Turks. 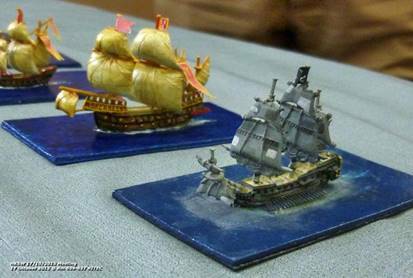 The points system I use does not penalise small vessels as much as the rules as written do, so the actual points value in the original rules was somewhere in the region of 1,400 points. I always like it when you design a scenario and then it takes a life of its own and this one certainly did. The commanders proposed but the enjoyable game system disposed. The landing parties languished because they were way down the priority list for command. The events of the tussle between the Charles Galley and the Black Pearl, including the latter’s eventual demise under the guns of Margaret Galley and the final indignity of friendly fire from its prize, were all generated by the system. 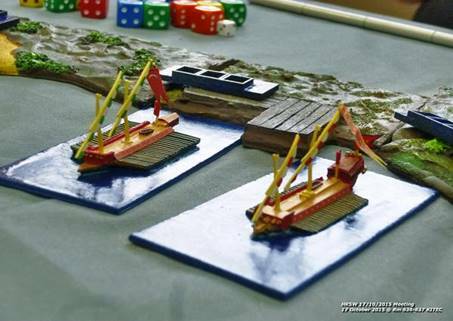 Likewise the Dutch command prospered when Jeff made a series of well-judged rolls, but the wheel really fell off when he had a series of failures turning the initiative over before the Dutch could fire, fight or grapple the prizes so temptingly within their grasp, whilst an apposite “All at Sea” roll sent the Endracht off by herself out of the fight. The Glittering Prizes: The plump, fully laden, East Indiaman still in the Dey of Tunis’s clutches. Perhaps our more perspicuous readers may be puzzled by some apparent historical inconsistencies in Pepys’ account. Ward was dead some 40 years before Pepys’ heyday. Barbossa is not believed to have met his fate in the Mediterranean if indeed he did “meet his fate” there for no body, only a black, richly feathered, hat and a half eaten apple, was ever recovered. Since he is variously reported to have met his fate and even be brought back from the dead in many places elsewhere, that is hardly conclusive. The action described at Sidi Bir Tee is reminiscent of Blake’s far more successful dawn attack on the Tunisian corsairs at Porto Farina in 1655. Whilst the British and Dutch might occasionally have loosely coordinated their actions against Barbary, they spent far more time keeping a wary eye on, or actually fighting, each other. The Margaret Galley did exist, (as indeed did all the vessels mentioned in the text,) and she was partially crewed by Native American prisoners, but until these revelations from Pepys’ diary most naval historians believed that she never left her station at Tangiers. However Hunt robustly defends his scholarship. Describing the historical record as “incomplete and speculative” he points to the certificate of forensic examination that came with the diary manuscript when he purchased it. This unequivocally states that the Times New Roman font and The Cannon MX517 laser printing are well attested to have been used in the Pepys household in the 1660s. He further asserts that the ending of Pepys’ diary entries in 1669 was not caused by Pepys’ fear that composing the diary by candlelight was damaging his eyesight but rather it was caused by the damnable price of ink cartridges.